My Book | SoftStone, Inc. There are many helpful books about parenting with different approaches on how to manage childhood years. However, teaching children social, emotional, and relational behaviors with a focus on emotions and feelings is only now becoming prominent in child-rearing. We have learned a lot about child brain development over the last 50 years. The brain is prepared to learn social and emotional behaviors from birth. Developing these skills is critical during the early childhood years. Social and emotional skills are not innate. They must be developed and practiced. For many years, the belief has been that we were born with these skills. We believed that growing up in an emotionally healthy family was sufficient. We now know this isn’t the case, although a supportive family certainly helps when dealing with life’s challenges. Children hear your voices a great deal, but also tune you out. Having a character with a voice that mentors with love and appropriateness will assist you in gaining their cooperation. CJ will give them an emotionally-safe space to feel, react, and choose. Psychologists often use puppets to help children express what they are feeling. CJ’s family of characters will assist you in the specific skill sets by mentoring them with fun and engaging voices and reinforcing being Creators of Joy. My story, and the last 70 years of my life, led me to write this book. It is my response to the meanness I endured as a child and adult. 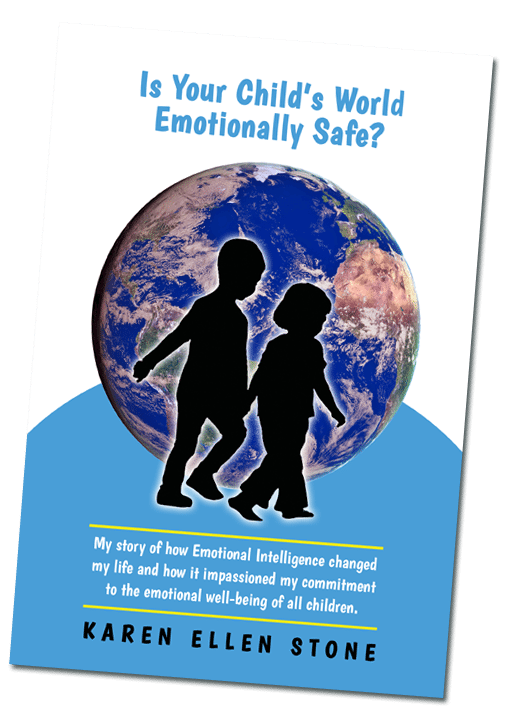 This book will explain why I have an unwavering commitment to the emotional well-being of children. I know my life would have taken a different direction without my subconscious beliefs, “I am fat, ugly, and stupid.” These beliefs were the result of the negative messages and voices I swallowed and endured. Through what I learned from my suffering, I hope to galvanize a movement that will provide a more compassionate and safer emotional environment for children. I believe all life has a purpose, as have the challenges, coincidences and many miracles in my life. This book is my response to them all. What is Emotional Intelligence and How Do We Behave and Feel When We Have It? Emotional Intelligence (EQ) is our ability to understand our feelings and manage our emotions within a framework of abilities: to empathize, self-motivate, delay gratification, self soothe and calm, not allowing emotions to swamp our ability to think, sustain hopes, dreams and goals and to persist in the face of frustration. These abilities stimulate the emotional center of our brain that develops emotional intelligence. It is important to differentiate between our two brains that perform very different functions but need to work in tandem to ensure personal and intellectual success, the cognitive brain and the emotional brain. The cognitive brain is for storing information. The emotional brain decides what we do with this information. Positive and negative memories are stored in the emotional center of the brain. The emotional brain grows the fastest during early childhood and starts to slow around the time a child turns five. So you see how important it is for a very young child to receive the positive stimulation and reinforcement required for a healthy emotional foundation. Daniel Goleman’s research found that the emotional center of the brain is eighty percent responsible for our physical, psychological, and cognitive well-being. All life decisions, from what we eat to our careers to how we raise our children, are made in the emotional center of our brains. What is Wrong with All the Anti-Bullying Programs? Psychologically, directing anyone not to do something (without providing an explanation) is not the way to go about changing behavior. Therefore, simply telling children, “No” or “Stop it” is effective in the moment, but should only be a way to get their immediate attention. Once you have their attention, it’s time to have a discussion about “No” or “Stop it,” or the action will repeat itself. It is also the time to talk about better ways to manage their emotions and behavior. Programs that have the same approach to inappropriate behavior are similarly ineffective. When children become emotionally intelligent, they do not feel the need to bully. After learning these social and emotional skills, bullying dissipates because it is no longer being fed. The negative behavior is no longer rewarded with attention. New positive behaviors are reinforced, and the good feelings are acknowledged and practiced. We are then saying “YES” to a responsible and relational community with feelings of kindness and respect. Our homes, schools, workplaces, and communities need to decide how they are going to function in the future so that we model and set an example for our children.